Outlook 2016 for Mac to Pst Migration can be overwhelming. If you are feeling so, read below to find a reliable solution. Outlook 2016 can import Pst files but can only archive data to Olm format. Which creates a bit of a scene as Windows Outlook can only read Pst files. So users moving to Windows Outlook from Mac’s find themselves in a bit of a crunch. One of the ways to convert is through a dummy email account capable of IMAP. In this method, a user has to sync the emails using internet connection to a server, and then sync it back from server to Windows Outlook client. There are no data files involved (Olm or Pst). However, using internet to sync the data (two times) can take a long time, depending on the speed. It’s also not feasible for those who have a limited internet usage. Furthermore, the entire job can become tedious because there are many manual actions one need to take. Sometimes the data syncing can get interrupted due to internet connection failure, and that results in incomplete migration. Therefore, it is used very rarely, especially in cases where only few folders are involved. The other option is to convert the files. You first archive everything to an Olm file, use a third party software to convert that file to Pst, and then upload it to windows Outlook. 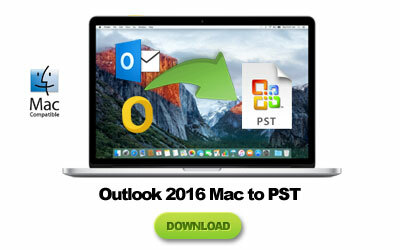 This method has become a norm, most commonly used method for Outlook 2016 Mac export to Pst. As a result, it also spawned a whole new batch of software category called Outlook 2016 to Pst converters to market. These third party tools can be found in large number, all claiming to be the best when it comes to file conversion. And to be honest, some of them are decent enough to convert your email data files. But majority of them will leave your data – and you – at dire straits. Those decent tools are few and far between; finding them will be hard. If you are here to look for such an Outlook 2016 to Pst converter, feel triumphant as you just found it. Gladwev Software known as the leading company for email migration solutions. Gladwev was dedicated to resolve the concerns regarding this industry. 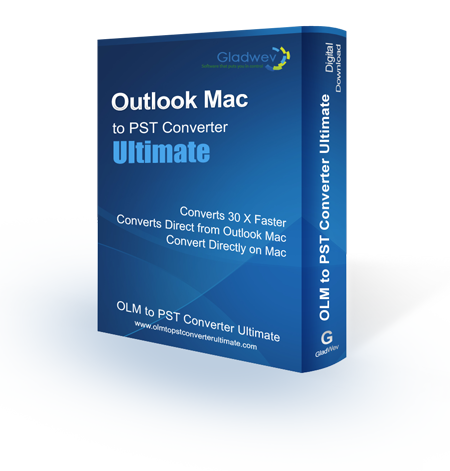 The solution they came up was “Olm to Pst Converter Ultimate” – one of its kind software to convert Outlook 2016 Mac to Pst files. Interestingly, its top features doesn’t exactly match to its name (Olm to Pst). The tool has an intelligent algorithms that detect your database from the identity folder and convert it to Pst directly. This means you don’t really have to archive from Mac Outlook to Olm files. Targeting the source database has a long list of merits, making Ultimate a truly effective Outlook 2016 to Pst converter. Furthermore, there is also an option to manually load Olm files from any location (called as ‘Custom’), instead of auto-detecting the database from identity folder (called ‘Express’). This can be useful in cases where there are multiple Olm files relating to multiple users. With the auto-loading option, it can only load your main identity folder or the backup folders. But other than that, there is no advantage of using ‘custom’ option. Choose it only if the data you want to convert is not in identity folder, but in Olm files. It is always recommended to choose ‘Express’ mode because of many reasons. Not only does it make the job easier, but also delivers higher data integrity for converted Pst files. High speed of conversion – Do not feel like wasting a lot of time on data conversion? Well, if you choose to convert your data through any means other than Gladwev’s Ultimate tool, you may have to spare quiet a few hours to complete the job. Most of the tools in the market are very slow, not to mention they work based on the old conversion techniques. Batch Conversion of Olm files – As said above, ‘Express’ option is the best way to go, but in few cases you might have to choose the traditional method by converting Olm files. Ultimate also have certain benefits even if it comes to traditional approach to Olm to Pst conversion. It can support batch conversion of multiple Olm files even of large sizes. Juts select the files altogether, choose your folders for conversion, and click ‘Convert’. The tool runs smoothly but quickly even when dealing with batch conversion and doesn’t compromise one bit with the overall performance and quality of the tool and of the converted files respectively. Folder Hierarchy, non-English text, and other items – Emails these days are not simple text messages. They contain a lot of things and these things can be hard to preserve when converting from Outlook 2016 Mac to Pst. Things like embedded images, folder hierarchy, non-English text, email headers, meta-data, email attachments, and other objects. Using ordinary tools can make the migration incomplete and imprecise, where the data in output files don’t really mirror the data in source files of database. This is where Ultimate truly makes a difference and proves its worth. It preserves almost every information or data element from Outlook 2016. The data you get as output Pst files mirror exactly the source database or Olm files. You won’t find any broken images, unreadable text, or messed up folder hierarchy. Split Pst – Splitting Pst files is a feature that is easy to ignore. And that’s exactly what happens with ordinary software for data migration. They are capable of Outlook 2016 export to Pst but overlook the flaw that large database will give large Pst files, which are difficult to import to Outlook. Ultimate will allow you to set the maximum limit of the output Pst file, and then it will split any file that will try to cross it, and create a second new file that will also be limited by the allowed size. If you want to try it, download the free trial version. The links are given below. The trial version can convert 10 items per folder, and doesn’t lock any other feature. There are so many features and qualities of “Olm to Pst Converter Ultimate” that it is hard to pick just one. It is a full package for users to migrate their data effortlessly and effectively. However, if one must have to pick just one, it would be how easy it is to use and how much user-friendly it is. The interface is designed smartly by Gladwev developers that allows even the beginners to use it without any trouble. Converting Outlook 2016 Mac to Pst has always been a huge headache for basic users, in fact, it has been a headache for even experts, but they somehow just get past it. Not so much the case with beginners. That’s why the first thing that was in the minds of Gladwev developers was to make a tool that’s not only powerful and feature rich but also easy to use by less experienced users. You just install it, launch it, and begin using it. There is nothing that is hard for users to understand or apply. Most of the features are put at the right place in the right time, and they make intuitive sense. The instructions are written in a way that even an 8th grader would understand it. Get it now. You won’t be disappointed.